“What do you think about that color?” It was my friend and general manager of Ontario VW, Earl Reed, coming down the stairs from his office. “I love it!” I replied. The next thing you know, I’m test driving the Rabbit Edition in another very cool color, Urano Gray. 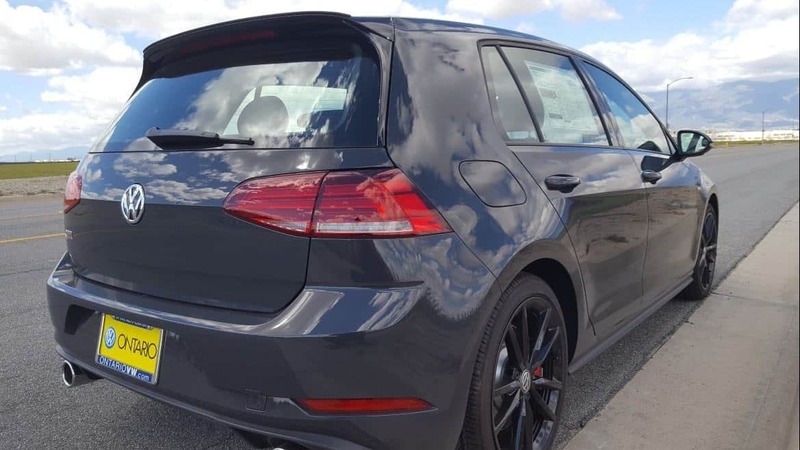 Click play below to listen to my complete review of the special 2019 VW Golf GTI Rabbit Edition, or you can read the review below. Either way check out all the pics of this truly special, and very limited availability, enthusiasts’ V-Dub from our friends at Ontario VW. 1983 was a good year. “Return of the Jedi” had been released, Mario Brother’s made its debut, and Volkswagen came out with its 1983 Mk1 Rabbit GTI. You may or may not remember its red plaid seats, snowflake wheels and golf ball shift knob, but it was something. This 1983 version had a true cult following and helped create and launch the hot hatch. Over the course of 30 years, VW has revealed different GTI editions with a nod to the Rabbit, but none of them carried the Rabbit name… until now. 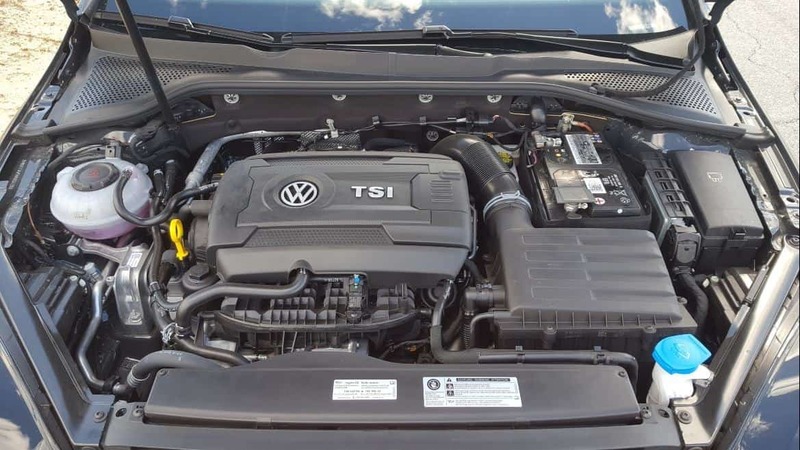 ’19 VW Golf GTI Rabbit Edition Urano Gray – my test driver. Jump to 2019, and the limited GTI Rabbit Edition is paying tribute to the Rabbit heritage. Its countless enthusiasts are awfully excited, and I don’t blame them. This Rabbit runs! Slotted in between the standard S trim and the upgraded SE trim, the Rabbit Edition has a starting manufacturer suggested retail price of $28,895. But as always, with our vehicle reviews. 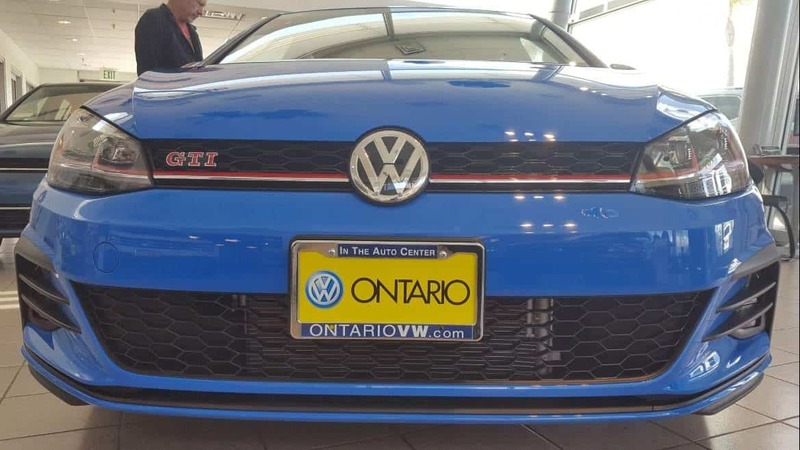 Don’t worry about MSRP because our partners at Ontario Volkswagen are going to give you the best deal in Southern California. Reach out to my friend Randy Halcomb there or email me and I’ll connect you personally. 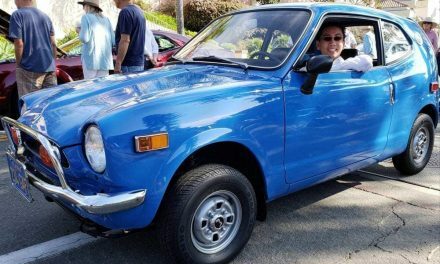 The Rabbit I drove had the 7-Speed Automatic is powered by a turbocharged, 2.0-liter, four-cylinder engine, putting out 228-horsepower and 258 pound-feet of torque. That powerplant is rated to deliver 25 miles-per-gallon in the city and 31 on the highway for a combined 27 mpg. This car is a blast to drive. I love the power and handling. And the power delivery is incredibly smooth. The turbocharged four-cylinder is one of the best. It’s not too overwhelmingly powerful but will give you instant response and solid acceleration. Turbocharged 2.0 liter puts out a (very) fun 228-horsepower & 258 lb-ft of torque! 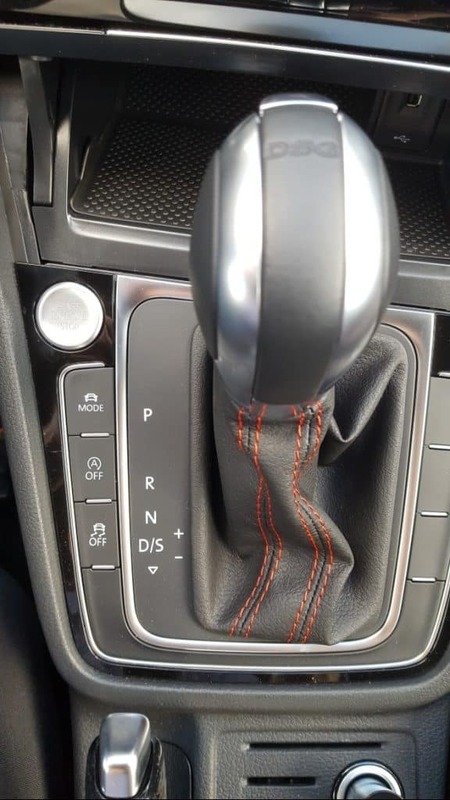 There’s an available 6-speed manual transmission, and while the GTI clutches are silky smooth, I might stick to an automatic like my test driver – which also has paddle shifters! Drive modes and push button to start and let the fun begin! 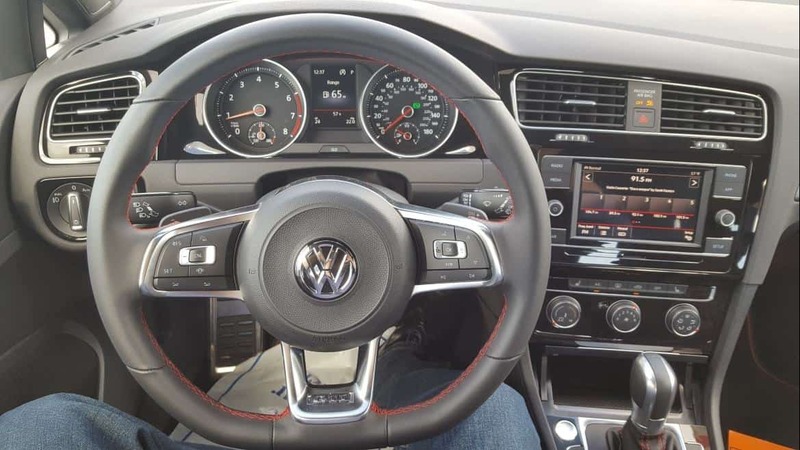 The GTI does come with different driving modes, which changes everything- the steering, the driving, the front differential lock, the adaptive lights, the climate control, and the engine sound. 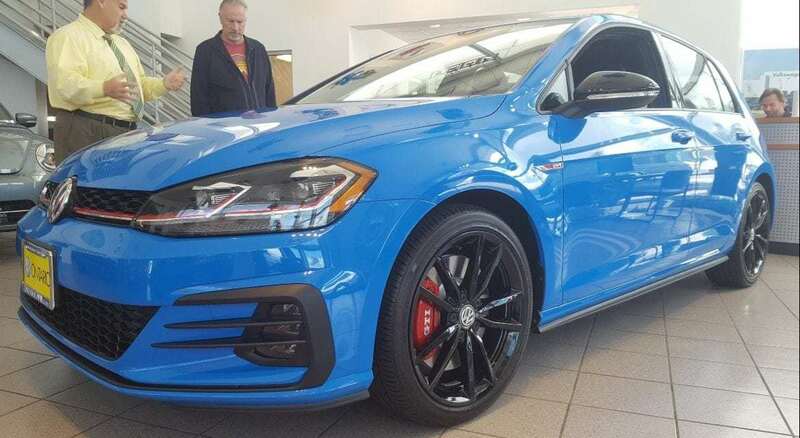 The 2019 VW Golf GTI Rabbit offers head-turning special edition styling and colors. It comes in Deep Black Pearl, Pure White, Urano Gray, and Cornflower Blue – which, as I mentioned, was immediately drawn to. Gorgeous Cornflower Blue 2019 Volkswagen GTI Rabbit! It comes with LED lights and keyless entry/ignition. The black sport 18” alloy wheels with the black-painted mirror caps look great, and the GTI branded brake calipers look as good as they perform. Where you really start to notice the homage to the Rabbit is in the interior. There is subtle Rabbit seat tags and floor mats. They’re subtle yet, in-the-know cool. Just as in the 1983 edition, you have the Clark Plaid cloth. 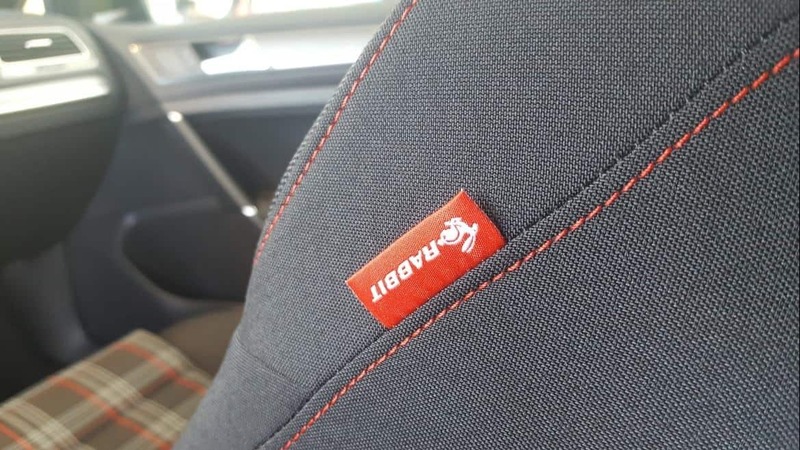 And the seats in the 2019 Golf GTI Rabbit Edition are seriously bolstered, making them not only comfortable but functional for when you decide the let your Rabbit stretch its legs! 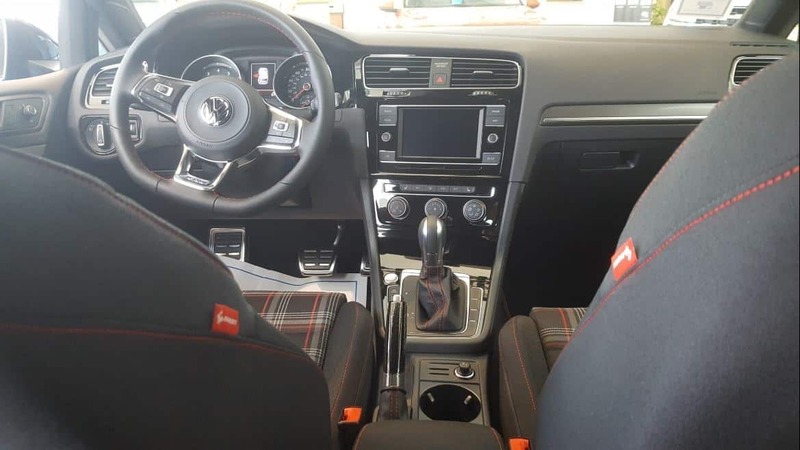 2019 VW Golf GTI Rabbit Edition – see those seat tags? For infotainment, the Rabbit edition offers Apple CarPlay and Android Auto smartphone integration. It also comes with nice interior ambient lighting, and red accent stitching throughout the interior which makes the car look sharp. There’s that Rabbit tag – subtle, but cool, right? Overall, it’s a super spacious interior, yet drives like a nimble sports car. 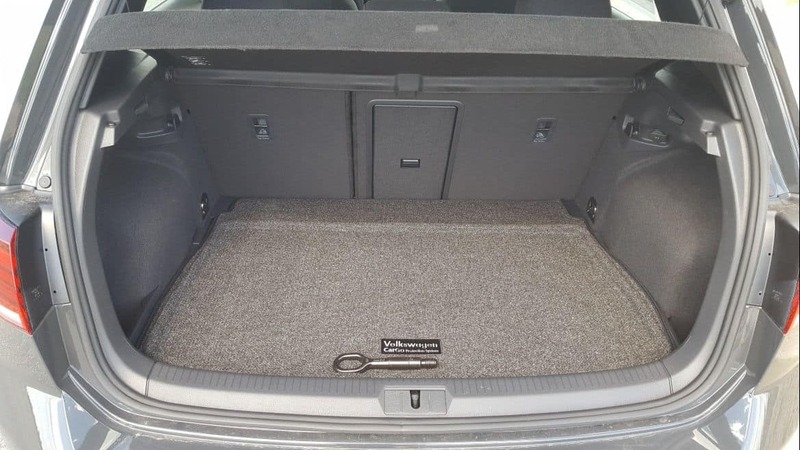 Behind the rear seats is 22.8 cubic feet of cargo space. Fold them down for 52.7 cu ft. Plenty of cargo space behind the hot hatch! The 2019 Volkswagen Golf GTI Rabbit, of course, comes with the hot hatch. And what’s great about this design is the amount of clean raw space you are given even with the back seats up. Now fold those backseats down and you’re talking serious space. This edition comes with the standard safety equipment, including antilock disc brakes, stability/traction control, automatic hill hold, front-side airbags, driver-side knee airbag, and side-curtain airbags. Rabbit delivers all the essentials. For driver’s assistance, it offers the handy adaptive front-lighting system, blind spot monitor, front assist with pedestrian monitoring, rear traffic alert, and a rearview camera system. 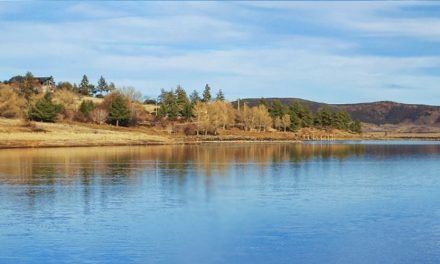 Great visibility – forward, backward and the sides. Because of the vehicle’s seats and slender windshield pillars, the GTI offers excellent forward visibility. The view to the sides and rear are great as well. As a parent, I particularly loved the ease of availability and configuration of the child safety seat latches in the back seat. And there’s ample room for child seats in the back seat. Whether you have your rear-facing infant seat or your rear (or front) facing toddler seat. There’s still room for someone in the front seat without squishing their legs! (If you don’t have kids then just know this – the Golf GTI Rabbit Edition is spacious (very)! Easy to use child safety seat latches in the back seat. 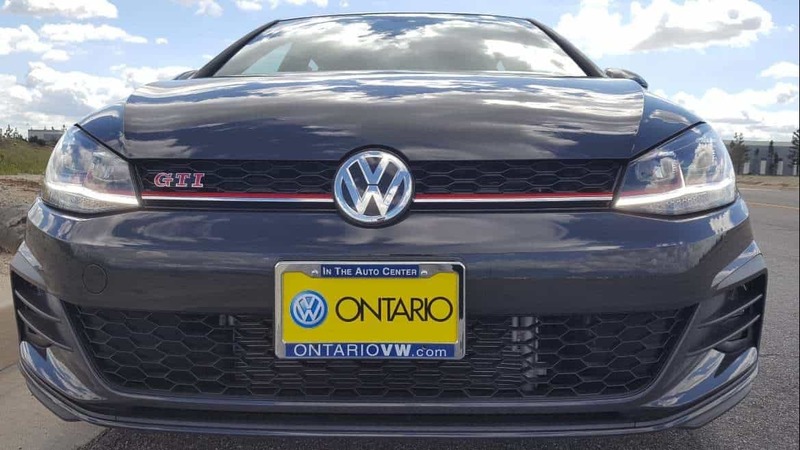 The 2019 VW Golf GTI Rabbit Edition also got a 5-Star Rating from the National Highway Traffic Safety Administration, which will put a smile on every loved one’s face! Serious backseat for a serious driver’s car! 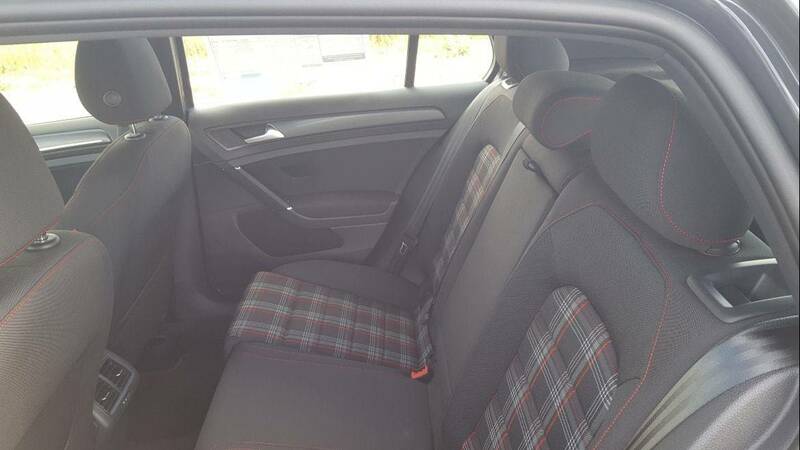 If you don’t have kids then just know this – the Golf GTI Rabbit Edition is spacious – very! Okay, here’s my Top-3 Favorite Things about the 2019 VW Golf GTI Rabbit Edition! 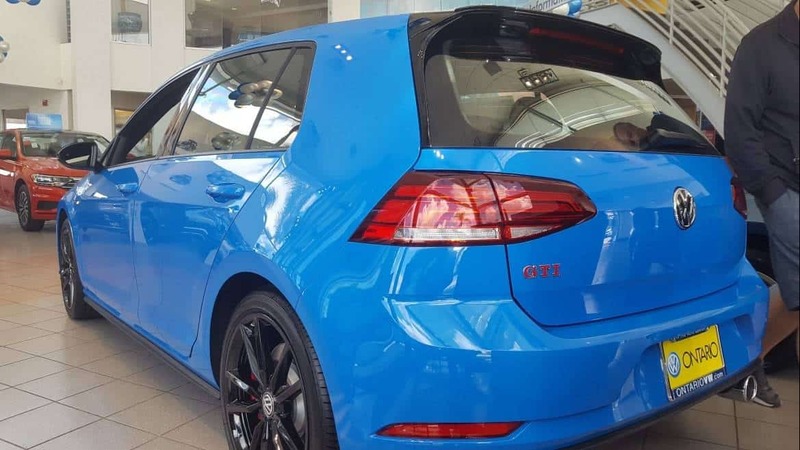 Exterior Styling: The Cornflower Blue with the red GTI badging, sporty wheels and red brake calipers – it just looks great. Power & Performance: It’s a Golf GTI Rabbit and it brings it as expected. It’s a fun driver’s car. It rides smooth enough for daily driving and brings ample performance. 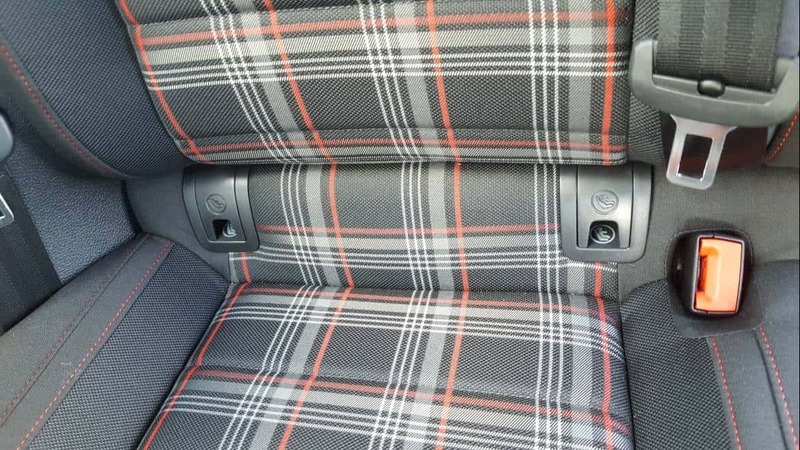 Interior Design: Love the subtle Rabbit tagging that in-the-know VW enthusiasts will appreciate for… ever, really. From its high-quality interior, nimble handling, and perfect seating position, this is a lot of premium-quality vehicle for the price. The Volkswagen Golf GTI is still one of the best performance-oriented compact cars available today, and the distinctive tribute to the Rabbit is seriously cool. I predict this will be yet another valued collectors car in years to come. Now that’s a hot hatch! 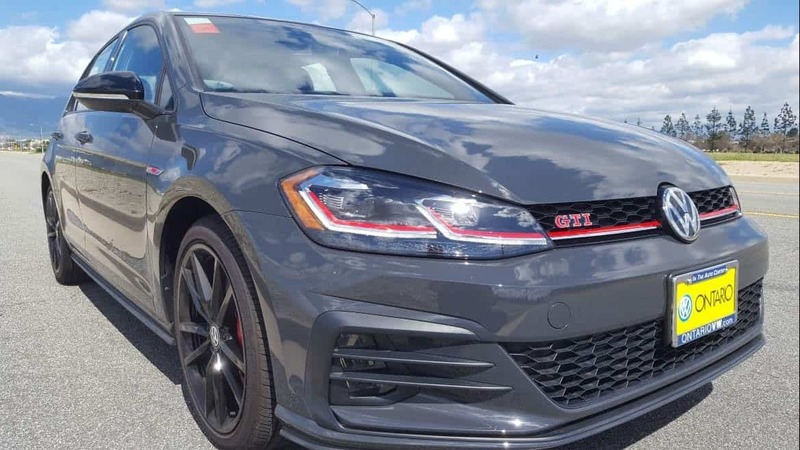 Whether you’re a VW enthusiast or just in the market for a great ride, you will not be disappointed by the 2019 VW Golf GTI Rabbit Edition. But don’t just take my word for it- pay a visit to our friends at Ontario Volkswagen to take one for a spin, and tell them Tom and iDriveSoCal sent you!